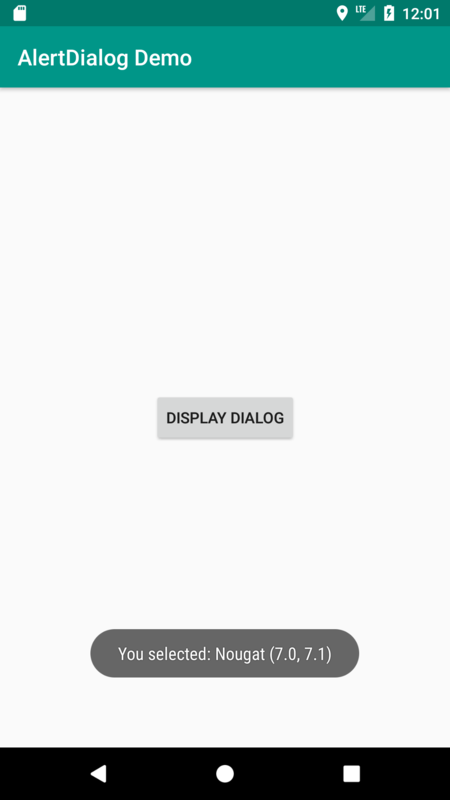 This post is second in series of tutorials to create and display an AlertDialog. Before starting this post, let us recap few things from previous post. To create an AlertDialog, we need AlertDialog.Builder and provide all required properties through the builder instance. Buttons are optional in AlertDialog, we can use all combinations of the buttons or we can choose not to use any button at all. AlertDialog can be created without any title. AlertDialog can be created without any message. In this post we will be using the code created in the previous post. You can either revisit the previous post or get the source code from GitHub. 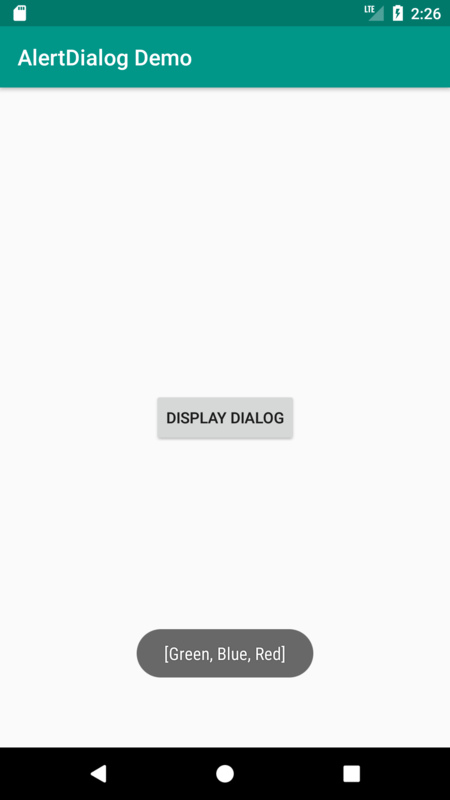 That’s why this post will contain only methods to display the AlertDialog. All boiler-plate code could be taken from the previous post. In this tutorial we will be creating AlertDialog which will provide options (single/multiple selection) to select from. 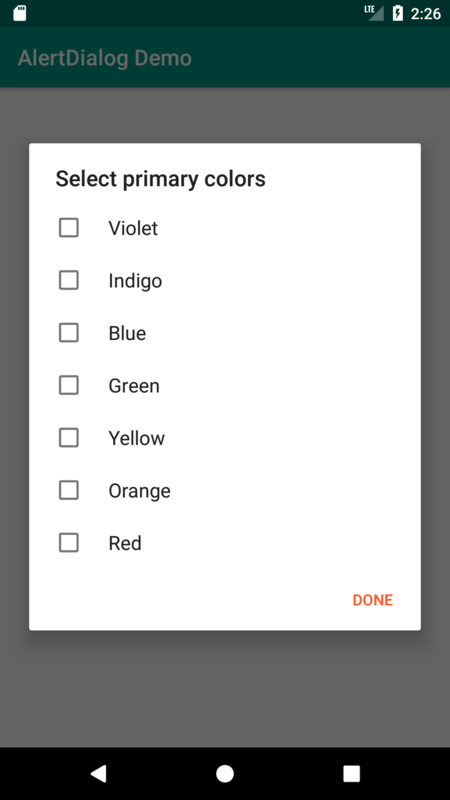 String colors will provide the array of colors in the rainbow, which will be used to first display the items in the AlertDialog and then for putting the selected color into the list. List<String> selectedColors will hold the name of selected color(s) in the list. Do not use setMessage() when displaying choice items. An AlertDialog can display either a message or the choice items. And, if both are used, then message gets priority over choice options. 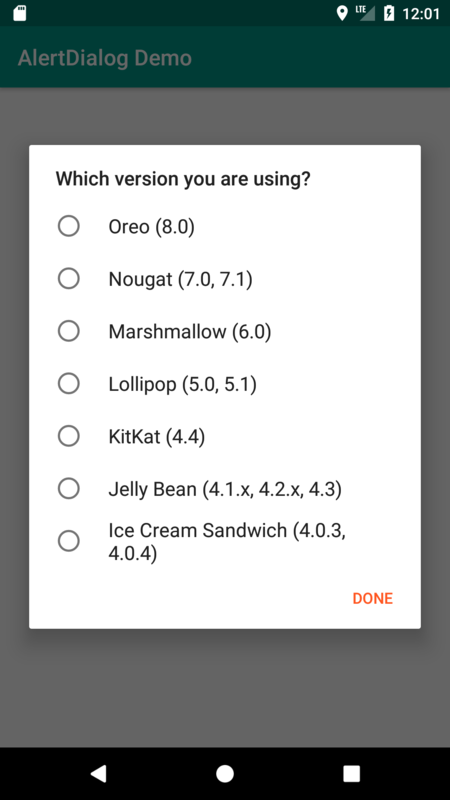 For instance, in a feedback users could be asked to select the version of Android they are currently using. This will need the AlertDialog to display a list of Android versions to choose from with RadioButton. After selecting the version user can click the Done button to close the AlertDialog. For this implementation we have to maintain two extra fields. int checkedItem: to keep track of last checked item and automatically select the last selected item. String androidVersions: to provide a list of Android versions to choose from.